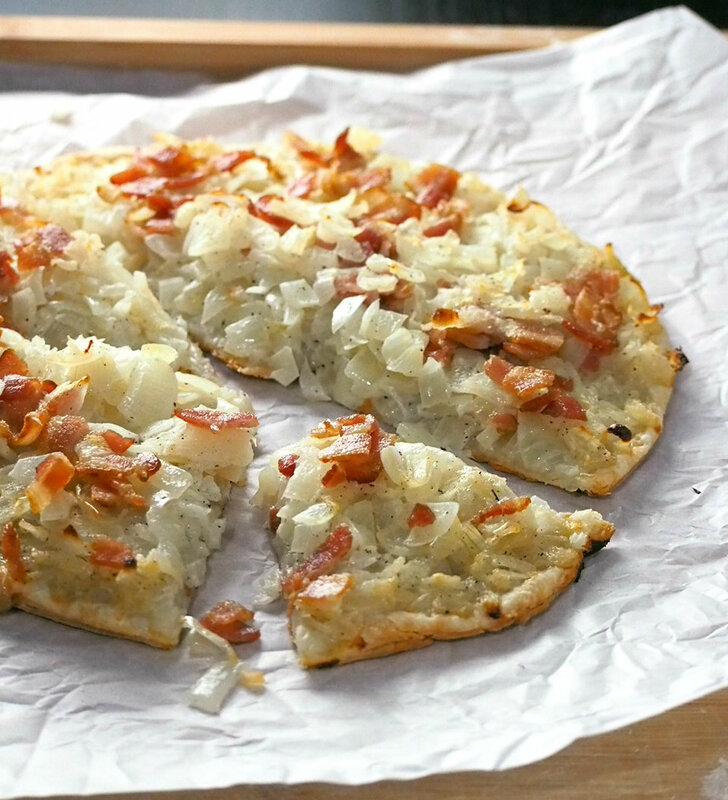 This Onion Tart is a tasty appetizer made with soft, juicy onions piled together with bits of bacon on a crisp and light puff pastry crust. We love a good appetizer in our house for those times when we just want a light bite before a meal or even a quick munch after breakfast. 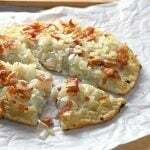 This onion tart is a perfect assembly of the food I love: onion, bacon and puff pastry. If you know me, I love anything that is flaky and buttery. 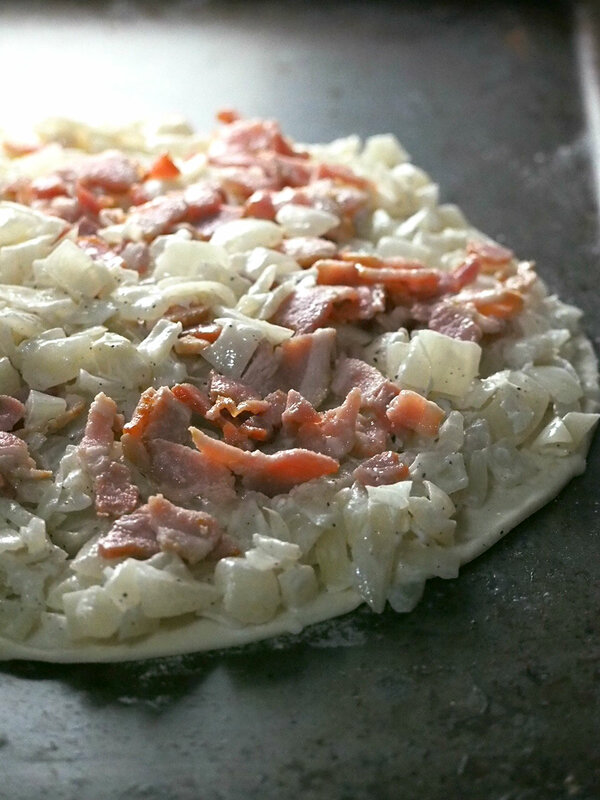 Puff pastry definitely fits that description, and in this onion tart, it gets elevated by the delicious and juicy flavored onions and bits of crisp bacon on top. 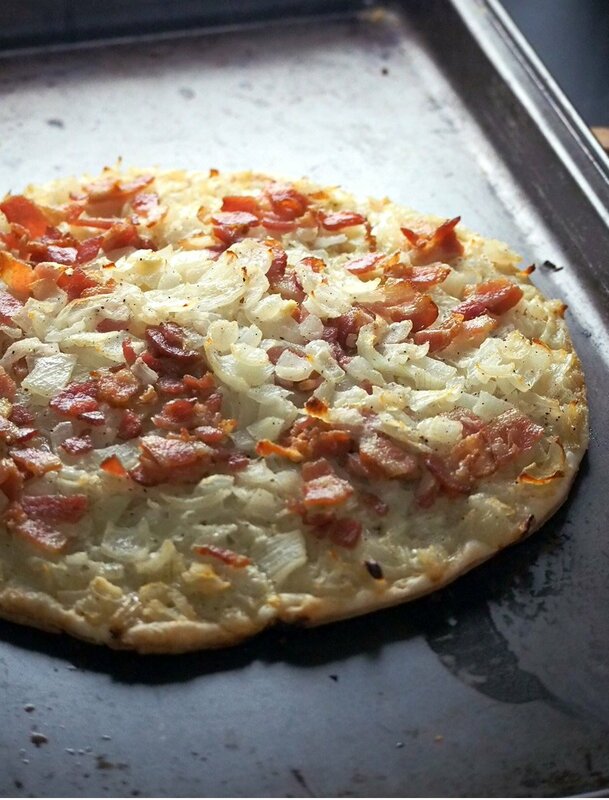 This is almost like a thin crust pizza but with the most amazing crunch. 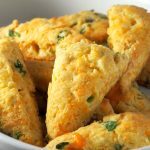 One morning, my kids practically devoured with my eldest saying that they taste like chips. I believe there is a validity to what she was saying. 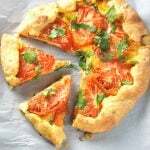 It is the thin, crisp crust, thanks to the puff pastry. The fact that there is frozen puff pastry widely available in groceries makes this recipe simple and easy. I am really loving them right now. I use them for sweet treats too, like these Caramelized Apple Tarts. With ready made puff pastry, I get to skip the rolling and folding part and still get a nice looking and tasty dessert, or in this case, appetizer. We all need an easy route sometimes! In the mood to make your own puff pastry? This recipe is my favorite. Once you have rolled and cut the pastry into a circle, be sure to prick lots of holes all over the surface with the tines of a fork. This ensures that the pastry will remain flat and not puff up during baking. Refrigerate assembled pastry until ready to use. Do not allow it to warm up. The pastry, rolled, shaped and with all those holes can be made a day ahead. Just cover it with plastic wrap and refrigerate. The toppings can also be made a day ahead. Just cover and refrigerate. If using frozen puff pastry, thaw the sheet overnight in the refrigerator. On a lightly floured surface, roll the puff pastry until it is 1/8 inch thick. Use a lid of the pot or the base of a tart pan to cut a 12 inch circle from the dough. Transfer dough to an ungreased baking sheet and use a fork to poke holes all over the surface. Cover with plastic and refrigerate until you are ready to bake the tart. This step can be made a day ahead. In a medium pot over low heat, cook together the diced onions and chicken broth until the onions are soft. This should take about 30 minutes. Drain the onions and once it is cool, stir in the heavy cream and season with salt and pepper. Set aside. Slice the bacon into little cubes and drop them in a pot of boiling water. Let them cook for a minute and then drain and pat dry. Heat a skillet and then toss the bacon for a minute or two just until lightly crisp. You don't want to over do this because it will make the bacon tough. Transfer to a plate and set aside. 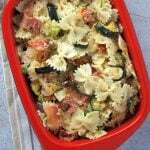 Both the toppings can be made ahead and refrigerated for up to a day. Preheat oven to 350 F. Top the puff pastry crust with the onions, spreading up to the sides. Level and flatten the onions slightly with the back of the spoon. Sprinkle the bacon and press them lightly into the onions. 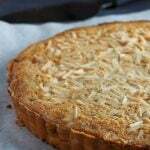 Bake in the lower third of the oven for 30 minutes or until the tart is lightly golden.